Even though it is already fall, it’s still a great idea to pick up some summer apparel (especially when it’s free). 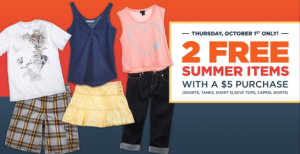 Stop by your participating Sears Outlet today, October 1st and get a two free summer items with a $5 purchase (includes shorts, tanks, short sleeve tops, capris, and skirts). Sign up for your free Shop Your Way Rewards card if you have not already.